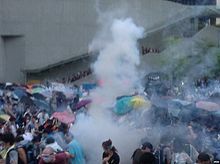 ^ Hong Kong’s “Umbrella movement” has become a war of attrition — Quartz. qz.com. [2018-09-21]. 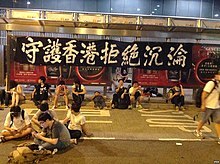 ^ Hong Kong's "Occupy Central" is US-backed Sedition. Land Destroyer. [2018-08-16]. ^ 12.0 12.1 俄國媒體：「佔中」是美、英策劃. 自由時報. [2018-08-15]. ^ Hong, Brendon. Hackers Attack Hong Kong Pro-Democracy Websites. 2014-06-18 [2018-09-21] –通过www.thedailybeast.com. ^ 22.0 22.1 22.2 香港專上學生聯會. 【守住大台　等候學子】. 2014-09-28. ^ 凤凰网. 周永康社交网络发文表示：“占中”处处失策. 2014-12-30 （中文（简体）‎）. ^ 新浪中國. 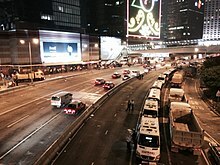 港媒：“占中”代价沉重 香港市民渴求安静生活. 2014-12-12 （中文（简体）‎）. 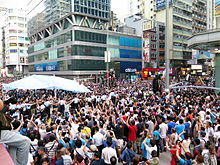 ^ What's next for the Hong Kong protesters?. The Guardian. 2014-10-07 （英语）. 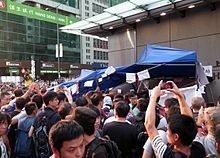 ^ Occupy Central: A Hong Kong Protest Evolved From Planned Sit-In To Leaderless Umbrella Movement. Forbes. 2014-10-08 （英语）. 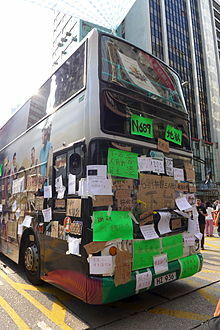 ^ Hong Kong’s “Umbrella movement” has become a war of attrition （英语）. ^ The Umbrella Movement Belongs to Everyone Who Calls Hong Kong Home （英语）. ^ 佔領運動取名「遮打革命」. 成報. 2014-09-30 [2014-09-30]. （原始内容存档于2014-10-06）. ^ 罷課變衝擊 黃之鋒被捕. 明報. 2014-09-27 [2014-09-28]. 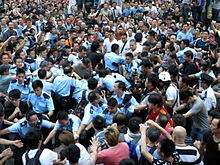 （原始内容存档于2014-09-28）. ^ 重奪廣場密議數天 百人打頭陣. 明報. 2014-09-28 [2014-09-28]. （原始内容存档于2014-09-30）. ^ 64.0 64.1 罷課變衝擊 黃之鋒被捕. 明報. 2014-09-27 [2014-09-30]. ^ 81.0 81.1 佔領示威擴港九 梁振英：我們不想香港亂. 明報. 2014-09-29 [2014-10-01]. ^ Alia E. Dastagir和Brett Molina. 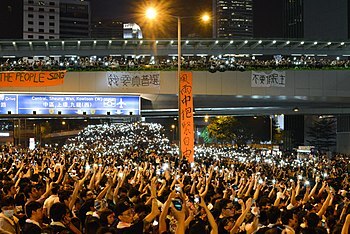 Key social moments of Hong Kong protests. 《今日美國》. 2014年10月2日 [2014-11-25] （英语）. ^ 115.0 115.1 八大院校　6,000人罷課集會. 蘋果日報. 2014-09-30 [2014-10-01]. 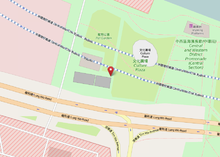 ^ 123.0 123.1 123.2 【佔領旺角】反佔中暴徒湧現 撐學生市民反包圍. 蘋果日報. 2014-10-03 [2014-10-03]. ^ 134.0 134.1 佔中學聯：不制止暴力 將中斷與政府對話. 明報. 2014-10-03 [2014-10-03]. 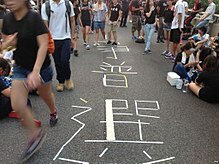 ^ 两黑帮参与占中反占中 警锁定黑道人物拘捕20人. 成报: A02. [2014-10-05]. （原始内容存档于2014-10-06）. ^ 零售業及酒店業界指受佔領影響生意大受打擊. 亞視新聞. 2014年11月1日 [2014年12月18日]. 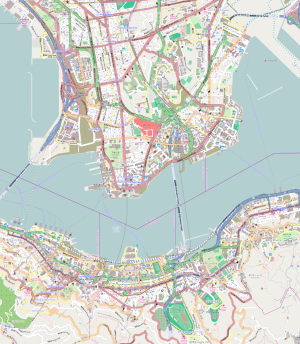 （原始内容存档于2014年12月15日） （中文（香港）‎）. ^ 新民黨及公民力量就「佔領運動的影響」進行民意調查 (PDF). 新民黨及公民力量. 2014年11月23日 [2014年12月18日]. （原始内容 (PDF)存档于2014年12月15日） （中文（香港）‎）. ^ 警棍扑頭可變致命武力 林卓廷憂局面不可收拾. AM730. [2018-08-21]. 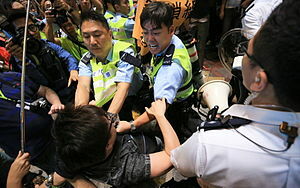 ^ Hong Kong Police’s Reputation Hurt After Tear Gas Use. Wall Street Journal. 2014-10-04 [2018-08-21] （美国英语）. ^ 女學警戴黃絲「被辭職」警掛藍絲受人權法保障. news.memehk.com. [2018-08-21] （英语）. ^ 警變本加厲 門貼11藍絲帶. news.memehk.com. [2018-08-21] （英语）. ^ 普選爭議：港大校長轟警向市民放催淚彈. 東網專訊. 2014年9月30日. （原始内容存档于2014年10月6日） （中文）. 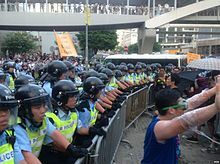 ^ Why Hong Kong police are 'celebrating' the attacks on protesters. GlobalPost. 2014年10月4日 （英语）. ^ 女示威者被性騷擾 特赦組織譴責港警. 東森新聞. 2014年10月4日. （原始内容存档于2014年10月6日） （中文）. ^ 「反佔」違禁令 繼續圍蘋果. 都市日報. （原始内容存档于2014-10-17）. ^ 反佔中者圍堵蘋果日報 阻運送報紙. 經濟日報. 2014年10月14日. （原始内容存档于2014年11月3日） （中文）. ^ 遭警棍扑頭　急救員視網膜脫落. 蘋果日報. 2014-12-25.